As many of you know, I’ve dabbled with blogging before. In retrospect, I wasn’t ready for the time commitment, nor comfortable with the level of authenticity that has come to shape my writing (and life). With Nursing My Appetite, I look forward to sharing one post and recipe each week on a day I’ve come to refer to as “Thankful Thursday” or “Thursday Thanks”. And what better day to launch than on the official day of gratitude? Today is my favorite holiday. And while there are some worthy contenders such as Christmas or St. Patrick’s Day, I don’t think I’d trust anyone who didn’t at least like Thanksgiving. What could be better than watching football while enjoying amazing food (and wine!) with loved ones? It lacks the pressure and expectations surrounding the exchanging of gifts, and instead embraces all ages and religious beliefs. More importantly (and simply stated), it’s a day of Giving Thanks. While some of us are conscientious of and grateful for the so-called ‘little things’ that make our lives so wonderful on a day-to-day basis, I’d guess that the vast majority of us have a bit of work to do in this area. While this is understandable, it’s also why I’m so thankful that we have a day that helps us to reconnect with our gratitude, and appreciate all that we are blessed with. 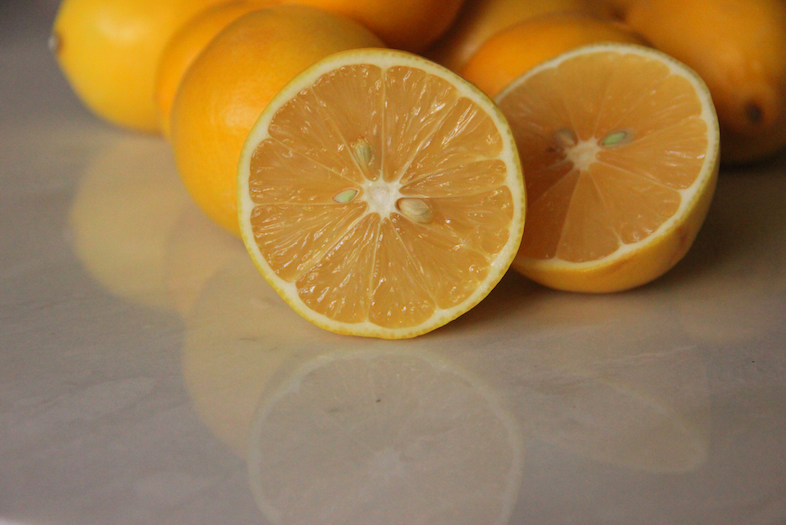 In addition to being the week of Thanksgiving, it’s also the week that Meyer lemons made their seasonal debut. For those that know me, you likely are familiar with my not-so-mild obsession with Meyer lemons. I’m as in love with their fragrance, flavor and versatility as I am with their bright and cheerful color. If you haven’t tried them, Meyers are sweeter and far juicier than other lemon varietals. And with a season that generally runs from November through March, they bring a fresh summer flavor to colder winter months. Needless to say I’ve been anticipating their arrival to my local grocery store for the past few weeks, and it was definitely worth the wait. While there are many new recipes I’d love to try, I decided to kick off the season with a batch of my all-time favorite lemon bars. I love this recipe, because it’s simple, flavorful and always a hit. Many lemon bars recipes yield far more of the lemon layer than the crust beneath, but I’ve adjusted the portions so that each layer is approximately equal. The result was everything that I’d been hoping for and more… sweet, custardy and the slightest bit tart. 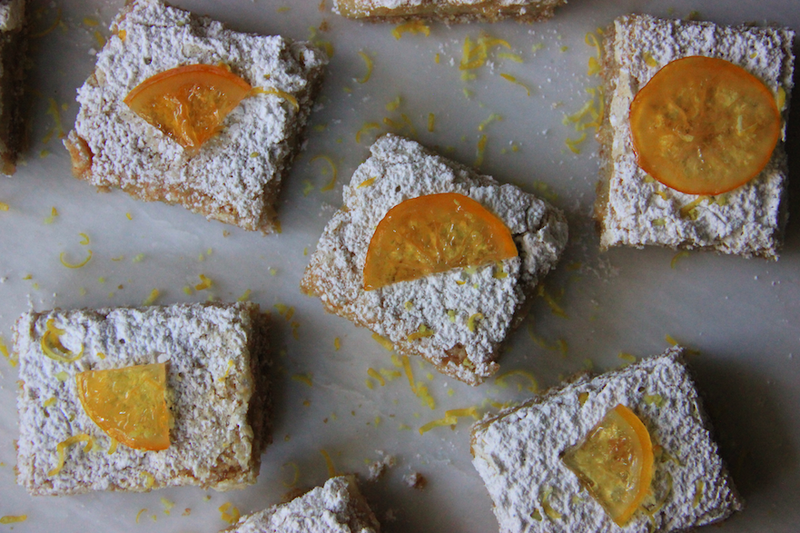 The candied lemon slices were a new addition, and inspired by a recipe by She Wears Many Hats. They were ridiculously easy to make, and just as fantastic atop the lemon bars as they are by themselves. Candied lemons can be enjoyed for up to one month in an air-tight container, though I’d doubt they would last that long! This recipe can be used for regular lemons or even limes, which I soon plan to incorporate into a key-lime dessert. Bon appétit! And here’s to being thankful for all of our many blessings. Prepare a bowl of ice water and a pot of boiling water. 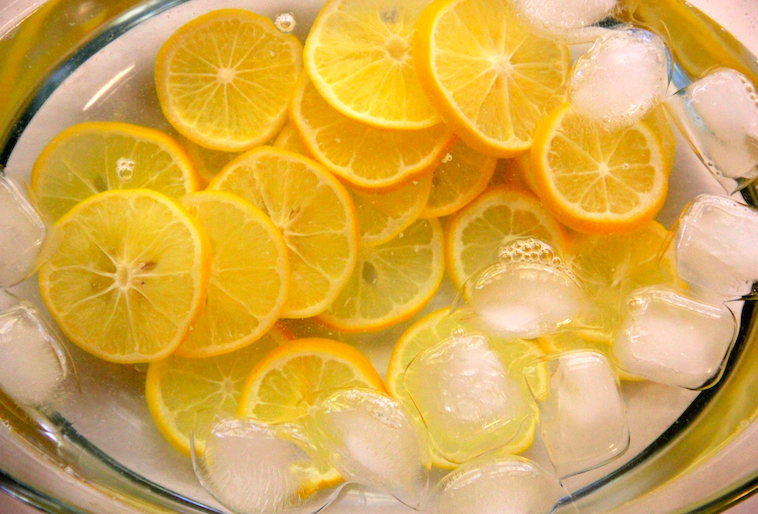 As soon as water is boiling, add slices of lemon and boil for one minute. Remove with a slotted spoon and immerse in the prepared ice bath for 2 minutes, then drain. In a medium to large sized skillet, boil 2 cups of water with 2 cups of granulated sugar, whisking until sugar is dissolved and small bubbles are forming. Add lemon slices, carefully trying to spread them out over the top of the skillet. 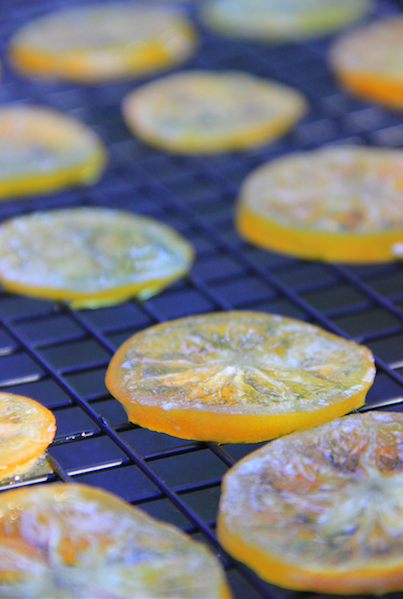 Allow the lemons to simmer for approximately an hour, being sure that the rinds are translucent before removing. 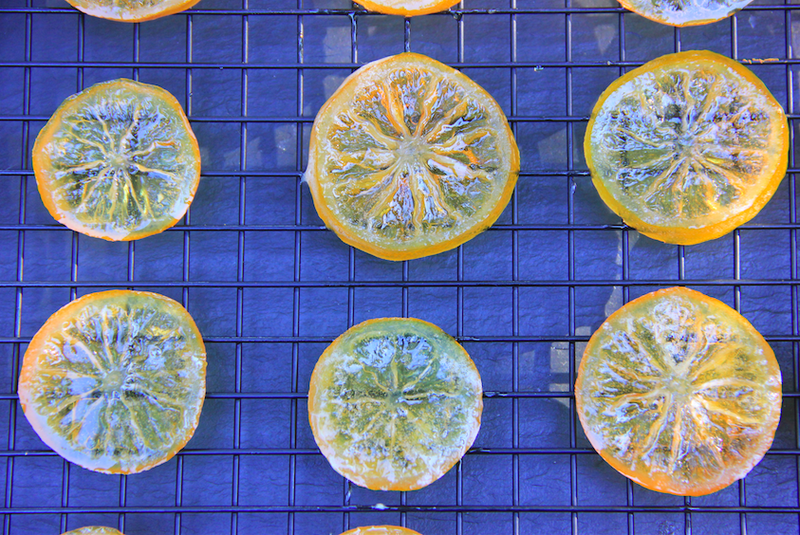 Once ready, remove the lemon slices and cool them on a wire rack. Preheat oven to 350 degrees. Line a 9” x 13” baking dish with crisscrossed sheets of aluminum foil. If aluminum foil is not a non-stick varietal, spray with a cooking spray of your choice. While the crust is baking, beat the eggs and egg yolks with 2 cups of sugar and 1 tablespoon of the coarsely-grated lemon zest and lemon juice. Add baking powder and ½ cup of sifted flour, and mix thoroughly. When crust is ready, remove from oven and pour egg and lemon mixture over hot crust and immediately return to the oven. Set the timer for 25 minutes. When ready, remove the lemon bars from the oven and let cool before cutting (I usually wait at least an hour if not longer). Cut as desired, and dust with powdered sugar and remaining tablespoon of grated lemon zest. 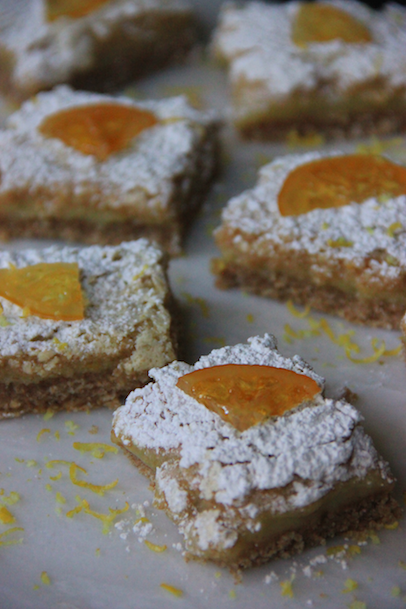 Top each bar with a slice of candied Meyer lemon and enjoy! *I personally prefer baking with whole wheat flour, but it does make it more difficult to determine when the crust has reached a golden brown color as it’s easier to identify with white flour.